Dynamic mechanisms key to understanding crystallization processes can now be observed with in situ microscopy. A white paper explains how leading chemical companies are benefiting from this alternative to traditional offline microscopy. Probe-based technologies remove the need for sampling and sample preparation, and eliminate the time-delay associated with offline sampling. Not only is key information about the particle size, shape and struc­ture observed but dynamic mechanisms such as growth, nucleation, agglomeration breakage and shape change are visualized and quantified. This enables scientists and engineers to fully understand the key crystallization mechanisms taking place and decide, in real-time, on the necessary changes for process improvement and optimization. 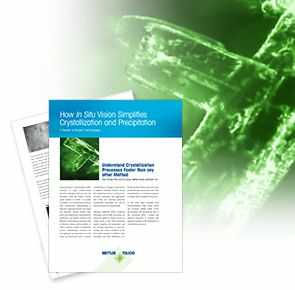 This White Paper demonstrates that in situ microscopy offers a faster alternative to traditional offline visualization methods and discusses how GlaxoSmithKline, Merck, Sintef, and University College Dublin (UCD) use in situ microscopy to gain a unique perspective of their crystallization processes.